(Left to right) Puneet Kumar, vice president at Nexus Venture Partner; Hemendra Mathur, venture partner at Bharat Innovation Fund; Vaidhehi Ravindran, vice president at Aspada Investment Advisors; and S Venkatraman, partner at Rabo Equity Advisors. 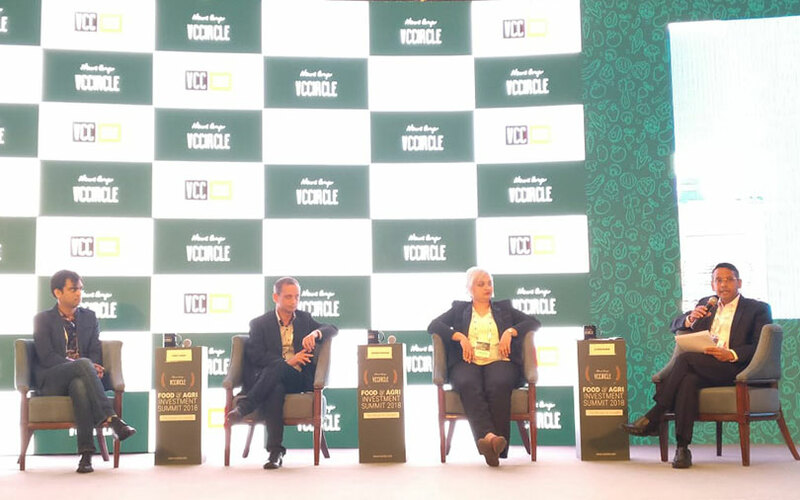 Indian food companies have huge growth potential but face a number of hurdles including the absence of a robust supply chain and a widespread distribution network, said panellists at News Corp VCCircle’s Food & Agri Investment Summit 2018. These obstacles, the panellists said, were not only leading to wastage of products but also affecting the margins of companies. The day-long summit kicked off in Mumbai on Thursday with leading food companies, food and agri-tech entrepreneurs, private equity, venture and early-stage investors as well as deal facilitators in attendance. The panel which sought to decode what is driving action in the food sector comprised Hemendra Mathur, venture partner at Bharat Innovation Fund; Puneet Kumar, vice president at Nexus Venture Partners; Vaidhehi Ravindran, vice president at Aspada Investment Advisors; and S Venkatraman, partner at Rabo Equity Advisors. The panellists pointed out that the segment comprising meat, seafood and poultry is a multi-million dollar opportunity. “In terms of export, this space has huge potential, despite mostly being unorganised. Seafood is itself worth Rs 30,000 crore,” said Rabo Equity’s Venkataraman, who was also the moderator of the panel. Aspada’s Ravindran said that the venture capital firm has been evaluating companies in the meat space and has discovered a huge gap in the ready-to-eat segment with very few companies in the mix. Mathur of Bharat Innovation Fund said that alternative proteins such as cotton seeds and pumpkin seeds offer a big opportunity but rued the limitations on the supply side. “There are more challenges are on the research and development side,” he added. Nexus Venture Partners’ Kumar highlighted that while non-vegetarians comprise nearly a fifth of India’s population, not everyone eats meat on regular basis and this is a factor which affects the margins of companies in the segment. The panellists further said that while the fruits and vegetables sector remains largely unorganised, firms are doing a lot in terms of aggregation. However, supply challenges are again a hurdle. “There is not one technology which can solve all the problems. Distribution and supply chain needs to be handled separately,” said Aspada’s Ravindran. The panellists also said that while the cold chain segment has attracted considerable investment in the recent past, companies in the space have yet to show significant scale. “You won’t find companies in the range of more than Rs 200-300 crore (in annual revenues),” Venkataraman said. For warehousing, the panellists were hopeful of companies scaling up were they to provide financing along with storage facilities to farmers. “Everyone has capital crunch. So financing is also very essential,” Kumar said. On health foods, the panellists said that though millennials are chasing after low-fat and oil-free items — particularly snacks — it is taste buds that will determine the long-term survival of these players. Norwest’s Kumar felt that health snacks are redundant for the Indian masses and that traders and mom-and-pop shops can easily replace them with alternatives if there is no demand.